In Langley there is an old orange house on a piece of property with wonderful potential for affordable/alternative living which Langley badly needs. It's right on the bus stop, walking distance to downtown Langley, already in an area of fairly high density and with very conscious and community oriented owners. Until such a time as Langley solidifies it's strategy for development, nothing can happen; but in the mean time it couldn't have a better, more fun use, than to be the home of RE-ART. More than any house in Langley, I enjoy driving by this one. Not because it's fancier than the others and impresses the 'Jones', but because it's real, and because it changes. The property is dynamic. Probably the best example of a vacant house that adds to it's community I've ever seen!! Southwest corner of addition to original building made of salvaged barn wood and telephone tie pieces. It was just about to fall over, had a rotten floor, and was wetter inside than outside. On the north side open air addition, the original 2x4's (inadequate for a 10' span) had been nailed to the original building's rafter/truss tails. We installed a temporary wall down the middle where the sag was greatest, and the rafters straightened right up. We then slid new 2x4's (crown up) along side these and nailed them to the other side of the rafter tails creating a pair of 2x4's every 24" securely fastened to the original buildings roof and walls. Better looking and twice as strong! Since the 4x4 posts were off the ground and rotten on the bottom anyhow, we replaced them with pieces 8" shorter. When we knocked the center wall out, the building settled nicely, rotating slightly at the connection between original buildings roof and new rafter pairs. Finally, we went back and put hurricane clips at all the connections. The South addition gets separated from the original building, cutting out the rotten parts, creating light and allowing us to increase the pitch of the now free standing shed. The building was one, and now it's two. The shed on the south side, built of salvaged telephone pole cross pieces and barn siding, was very rough and had a roof with not enough slope. Our solution gave it more slope. The South addition, now separate. You can see the telephone ties which made a great floor and would still be there (no pun intended) if the roof hadn't been leaking for 20 years. The window was twice as wide--I just slid the window to the side, cut the frame with a sawz-all and now there's an insulated window half as big! We did this at John's suggestion by 'detaching' the buildings. The area we cut out was the area of greatest damage, so it worked out great. When we replaced the multi-piece header with a single salvaged beam, we raised the pitch of the existing rafters by about 5 degrees. This makes all the difference in the world in how it drains. After patching some of the roof decking with salvage pieces from around the property, we clad the top in salvaged metal, also from the property. The building had an interesting prow. It was a cantilevered beam with a cable running to the back of the structure where a cement block, a cast iron stove part, a few window weights and a crank shaft were all wired together serving as a counter weight for the garage door. Seeing potential for outdoor covered space and additional building protection, we framed the roof out to this point and what a difference that made to the aesthetics. Quite a handsome little building now! Finally, we sheathed the original building with new 1/2" ply-wood (dbBrad doesn't use OSB), nailed off to 6Perim/8Field and covered with 30# felt. Only a few dollars more per square than 15# and such a better product. Alsip property, Langley WA, home of Re-Art. 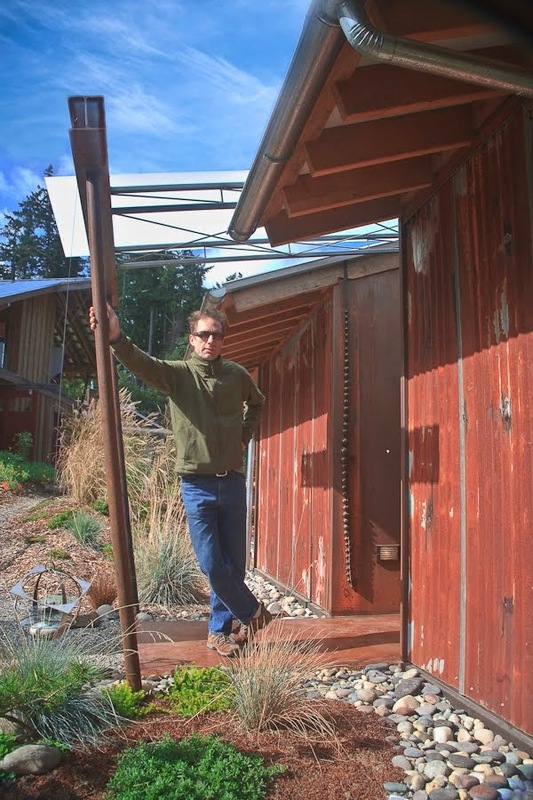 The Whidbey Island Arts Council 'studio tour 2010' features 84 artists at 44 locations. dbBrad had furniture at one of the stops, Lois's studio which we remodeled last year. Turn out was good but sales were not. But with all the happy people, good art, beautiful weather it is really a nice family event. I didn't sell much but the response was very encouraging. Everyone loved my furniture and told me they'd never seen anything like it. I get that allot!! The counter part to 'The Machine', the studio table has the same top and open feel but utilizes flat file cabinets from her mom's old art studio. The pipe were all remnants and the stainless steel legs are from Ikea. In fact Lois mentioned she thought more people were commenting on her house than on her art. I must say that the thing I heard the most from people was that they loved both. '2 legged' table is a piece of maple from Rob Hetler's 'not good enough' pile and two steel remnants with my little recycled block and rubber band card holders. The Captain's Table, so named because the pipe flange base was surplus from Nichols Brothers boat yard via Island Recycling. In the background you can see Lois house with her outdoor art on the recycled steel screens. And with that the tour was wonderful. Thank you to Lois for letting me show furniture in her driveway and for the extended use of the garage as a shop. My new and most favorite piece yet, the 'Squalicum Beach Table', this piece of wood was obtained in a creosote clean up, the pieces of pipe were remnants from a previous dbBrad project and the channel was salvaged. Squalicum beach table. Though the wood has a strong patina, it's very sleek and clean. Because the piece of wood was so heavy, the table tressell is designed to flex enough for the wood to be removed from the steel. No fasteners at all. Unfinished and awaiting an owner to guide the design of the base, this table is 48" x 96" and features glass insets on woven wire mesh. Leftovers from Island Sash and Door, Chery's Living Gate, FrEdLey railing and candlestick from my dad;s wood pile. In the background the 'Flintstones Table' is visible, with it's 30" wheels and block accessory stools. Elementary Union Table. Base from Elementary school in Seattle and top from Salvaged Pier Beam on Lake Union. Squiggly Library Table defies gravity with the wood and the steel seeming to not touch. DESIGN QUOTE: I am very honest with my (found) materials and pay close attention to what they are and what they want to be. My desire is to change my salvage pieces as little as possible but maintain high resolve in the design/connection. Tension Table was a fairly successful experiment to use steel in tension and bolts only in sheer. Minimal fasteners on this very strong, but some what top heavy table. These last two pieces I made several years ago but I'm still very fond of them. After draining, the edge had to be cleaned and prep'ed for new work. With too much liner showing and a concrete retaining wall which wasn't wearing well either, we are draining the pond for re-working. Even though the liner and concrete wall were underwater when the pond is full, they could be redily seen through the clear water. With good weather and a bunch of new rock, the time had come to fix it. A 'not so dry run' of new creek. At the FrEdLey residence, as with all my ponds, they are primarily functioning water collector systems, but with aesthetic and habitat features often more noticable. And when you add Fran Abel Landscape Design into the mix, the aesthetic component becomes so overwhelming that often people don't realize it's a functional and necessary water collection system. It all starts at the upper pond where we collect the water from all three roofs (242,000 gallons per year) and any surface water runoff. However, with the healthy soil, mulch and bountiful plants, there has been no surface water to speak of since completion of site work two years ago. Upper pond where water collects. From the small upper collection pond, the water travels down a stream between the buildings to a larger pond. This larger pond then drains to an adjoining fen or wetland where the water can linger until it is absorbed by the earth. Everything works and looks great. The reason we're renovating the lower ponds is mostly because of water clarity. It wasn't until this summer that we began running a pump to have water in the stream when it wasn't raining. This water is drawn through a simple filter of PVC pipe with holes buried under pea gravel. Although simple. it works so well that our water has become crystal clear. Too clear, highlighting more than the fish! So we've done two things. We've extended the stream up to the vegetable garden so that water from the ponds can be used for irrigation, and we've renovated the edges of the large pond to accommodate varying water levels and to provide more visual interest for viewing as well as a more natural lining for our Koi. A little lesson in absorbtion. Here is what we found. Our pump, by the way is modest, moving only 300 gallons per hour. On the first day we pumped water for 6 hours lowering the main pond by 18" moving a total of 2200 gallons. Though the new stream is 30' long, only half of it ever saw water. It just vanished into the sand. On the second, day we pumped water for 3 hours moving 1100 gallons of water. Interesting that the land had lost much of it's ability to absorb water from the previous day's pumping and the entire stream saturated and began to overflow into our upper pond. One day later, half the water and way less absorption because the soils were already saturated. On the third day, we only pumped for 2 hours, about 700 gallons and the stream immediately began to overflow. Absorption had now entirely diminished. What this says to me is even with sandy soil that appear to initially have superior drainage, watch out! The ground can become saturated quickly. So even if you have loose sandy soils, if it's saturated and if there's hard pan (clay layer) below and when adjacent compaction prohibits lateral movement, then in floods, onto the streets, into the storm drains and out into the sound. At FrEdLey, this was our goal and the pond was designed to have a variable water edge and when it floods, it does so into a controlled wet land (fen) where the water can linger until the ground can absorb it, regardless of what's happening at the neighbors.